Hello lovelies! 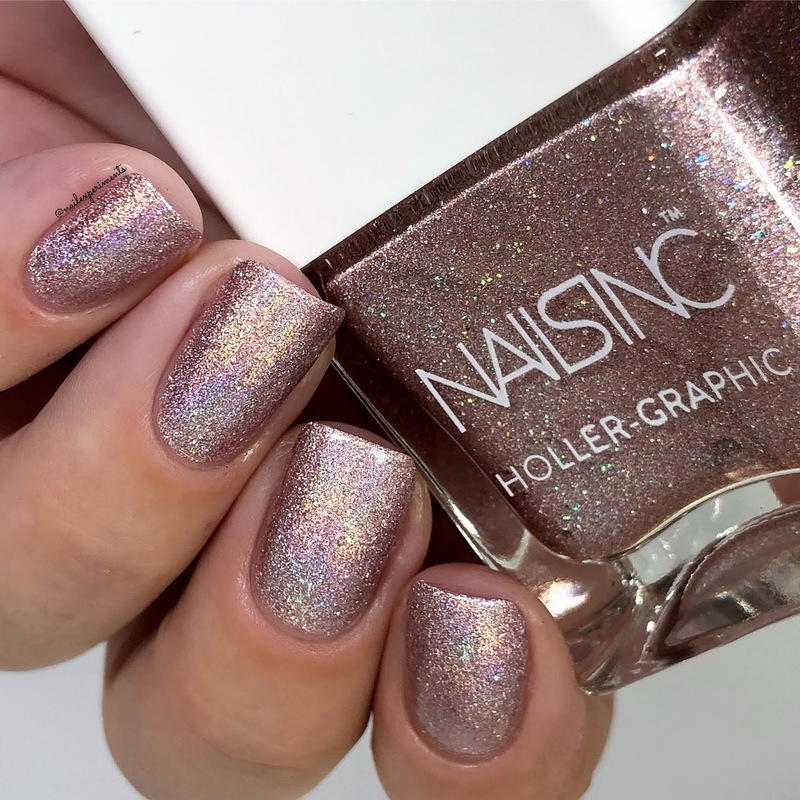 Today I've got swatches of the 4 holographic shades from the Nails Inc Holler-Graphic collection. This collection launched earlier on this year during Spring 2018. 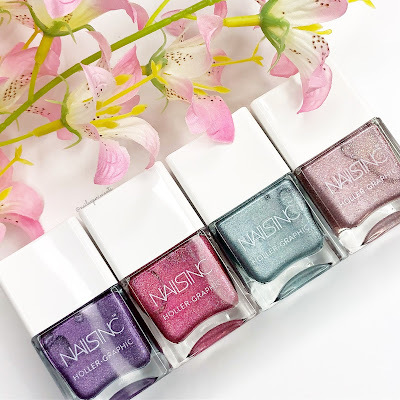 All together this collection contains 5 polishes: the 4 you'll see swatched in this post and a silvery one (I don't have) that comes in a duo pack along with the below shown Molten My Day. I love seeing mainstream brands dive into alternative finishes, especially with rainbow holographic goodness! 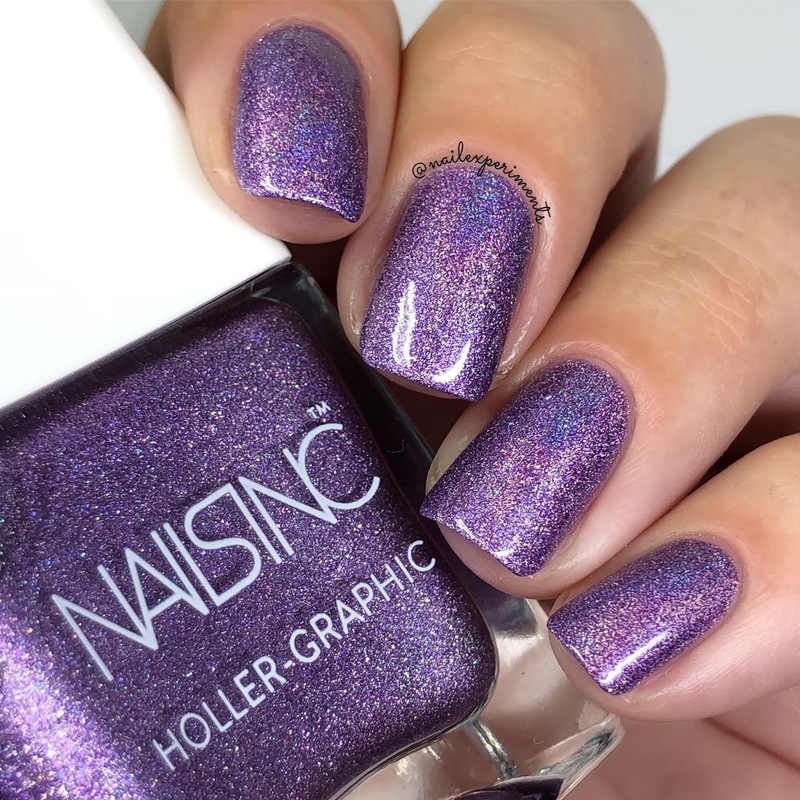 Get Out Of My Space is a medium purple filled with holographic goodness. Although this is on the medium shade spectrum, it is quite rich in colour. 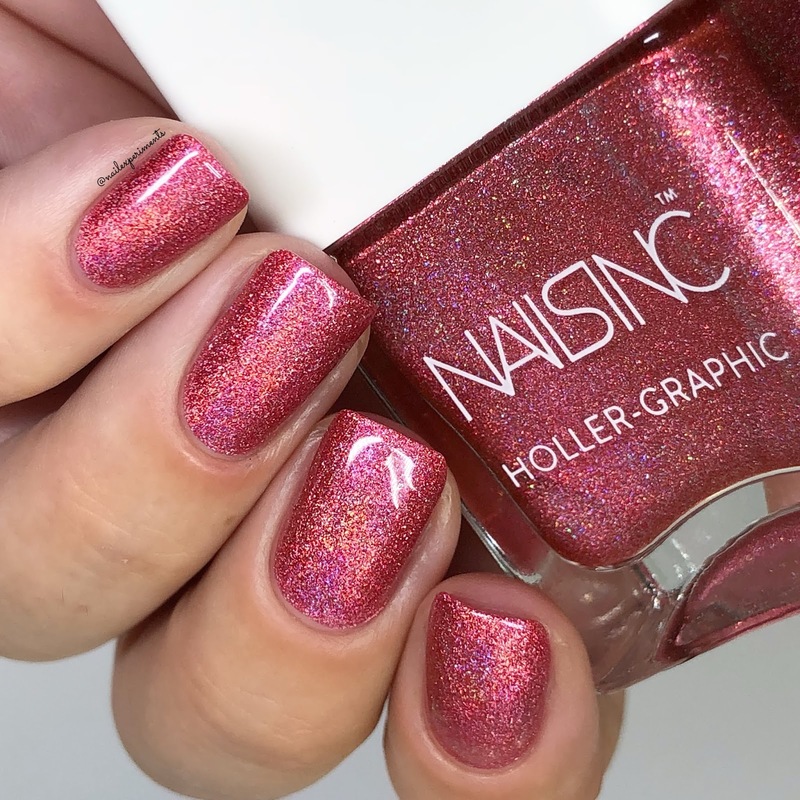 I applied this sparkling beauty in 2 easy coats, paired with a quick drying glossy top coat. Molten My Day is a magenta holographic. 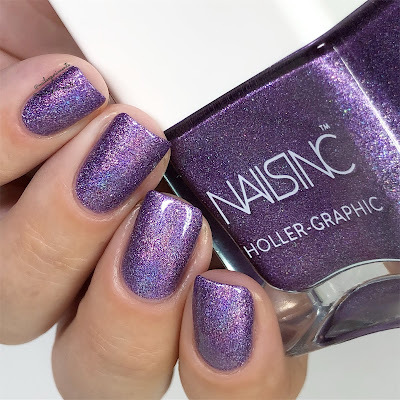 This beauty applied easily within 2 coats and sealed all nails with a quick drying glossy top coat. 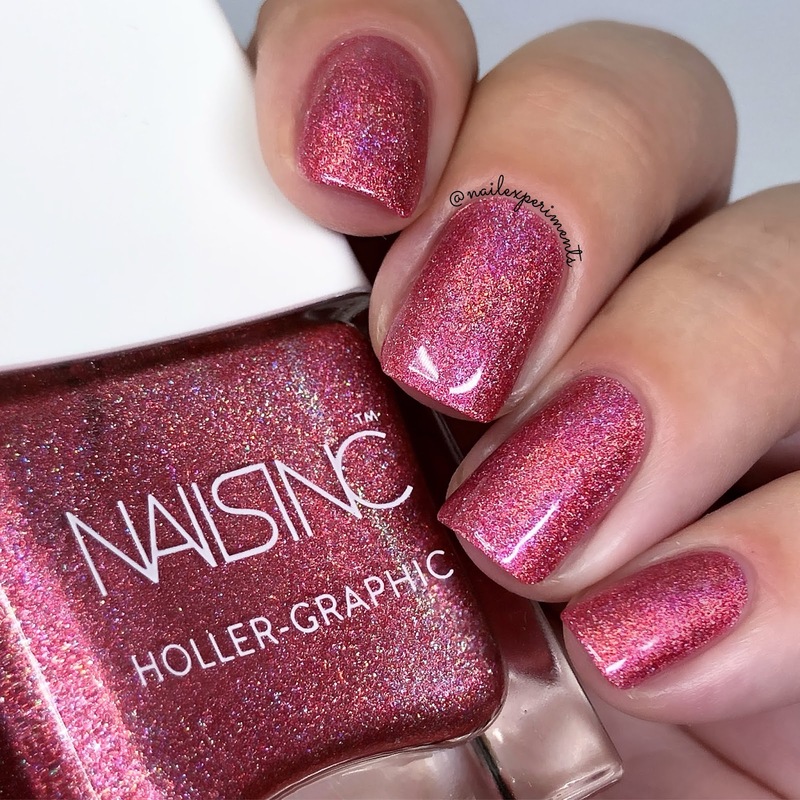 In my swatch photos down below it seems to be looking more red and in person this polish definitely pulls more magenta/pink. 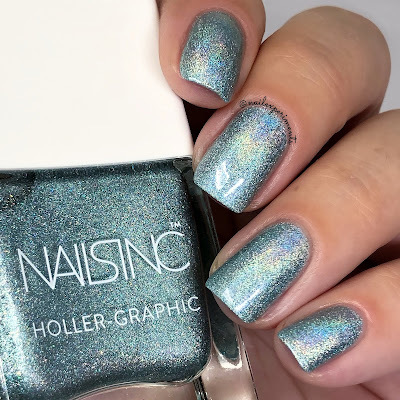 Cosmic Queen is a light sky blue holographic. This rainbow shifty beauty applied to full opacity within 2 easy coats and sealed in all the nails using a quick drying glossy top coat. Cosmic Cutie is a pale rose-gold/pink holographic. This beauty applied easily within 2 coats and sealed in all nails using a quick drying glossy top coat. This one out of the 4 is the most unique shade and must say it is my favourite! If you don't already know, all things holographic is very trendy at the moment. 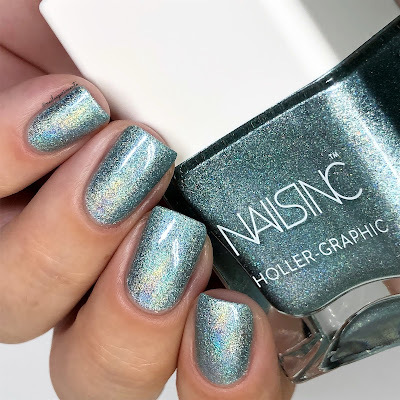 I've seen it time and time again where brands will market items as holographic, when in reality they are more so a mermaid-ish iridescent vibe. Still pretty, but NOT holographic. 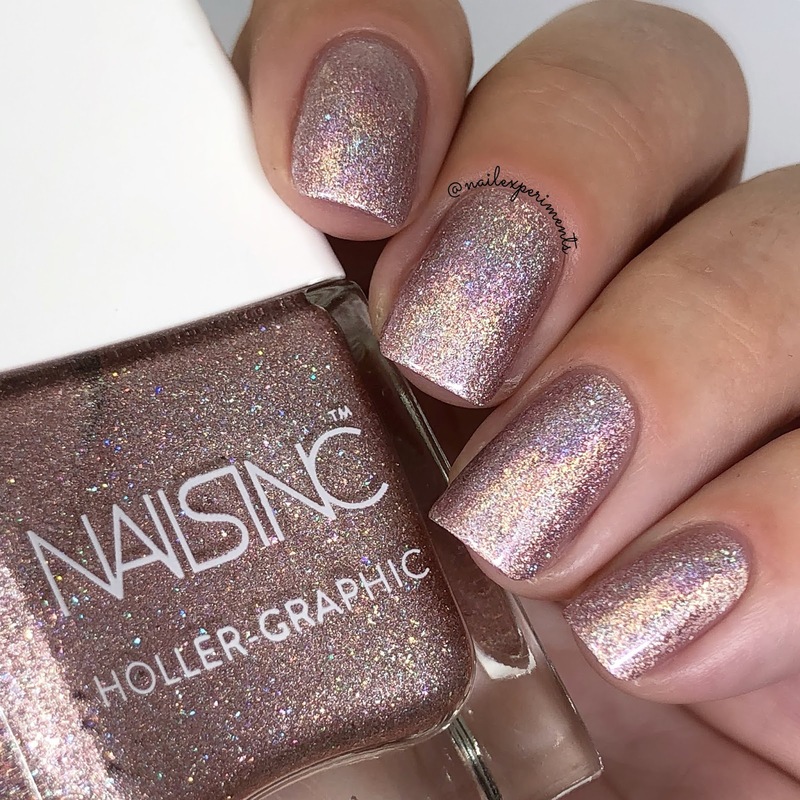 These holographic polishes are definitely 100% holographic made with actual unicorn tears, gathered from Mount Unicorn up in a galaxy far far away - HAH! Seriously, these are beautiful and aboslutely love it when I see mainstream brands offering fun finishes like this! One final side note, as I noticed this when applying and top coating the polishes. Upon application, the holographic finish wasn't as prominent as it was after it had a few seconds to dry down. Once I applied top coat, my face scrunched into a sad face because the holographic-ness of it all dulled out. After a few seconds, I seen it resurface back to life - yay! Just wanted to toss that into the mix incase you decide to get these polishes for yourselves. For reference the top coat I used was from Glisten & Glow - a holy grail of mine!